Working With the Flow. Yes, That Flow. It’s that time of the month again. And you’re probably experiencing those unpleasant side effects like cramps and bloating that make you feel like not doing much of anything, especially working out. But exercise can be really beneficial when you’re dealing with your period. Physical activity releases endorphins into the body, which can improve your mood and get rid of feelings of depression and anxiety, and it also increases blood flow, loosening muscles in your lower abdomen, back and thighs. Today, Leah Britt, a certified personal trainer and nutritionist for Premier Fitness Camp shares tips on how to work through menstrual symptoms while exercising. 1. Get moving. Include physical activity in your daily routine. Women who participate in regular physical activity generally report fewer PMS symptoms. 2. Skip the salt. Limiting the amount of salt in your diet can help prevent water retention, which is a main symptom of one’s menstrual cycle. Pay attention to hidden sources of sodium, such as soy sauce, canned vegetables, soups and deli meats. 3. Hello, H20. Drink plenty of water during your menstrual cycle. Your body will expel what it doesn’t need. 4. Yoga watch. For yoga fans, avoid certain yoga positions. Inverted poses during a woman’s period may be harmful to them as the effect on the menstrual cycle is directly related to the duration of the inversion. 5. Warm it up. 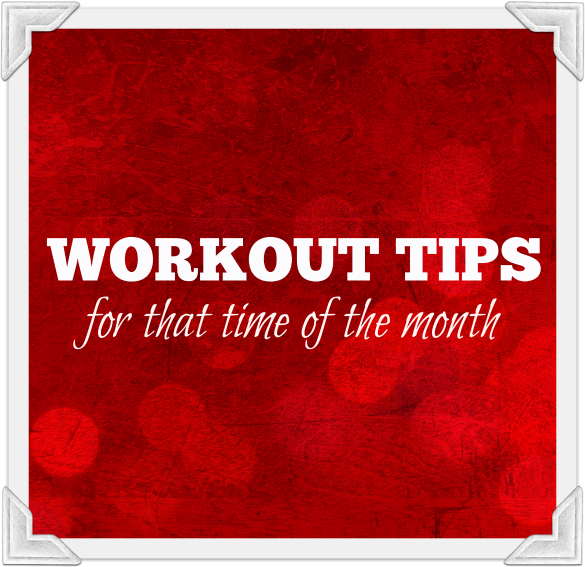 Use heat to relieve cramps so you can get to the gym and stick to your workouts.